Snowdon. It’s a big mountain. A train runs up it. There is a cafe on top. People like it. Walkers mass on it in their droves. These things you probably know. What else? Well I am told it’s a race for road runners; no harm to the advocates of this sentiment but a park run this is not. It’s a long way back from top; that is true. Your feet will be burning by the finish; maybe, depends how you fare on getting back – see last truism. 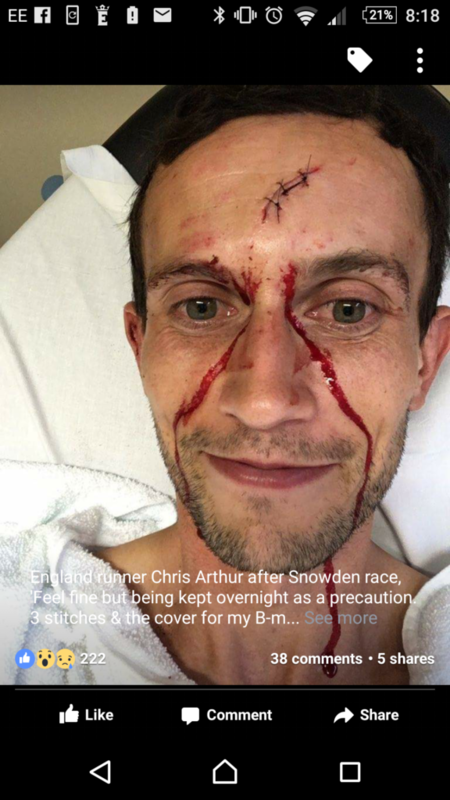 It’s very runnable; this is a fact, although that depends how you cope with your trails being broken up by sections of rocky slabs, sharp rocks and just immovable objects – ask Englishman Chris Arthur who was challenging for the podium before checking his head with a rock. 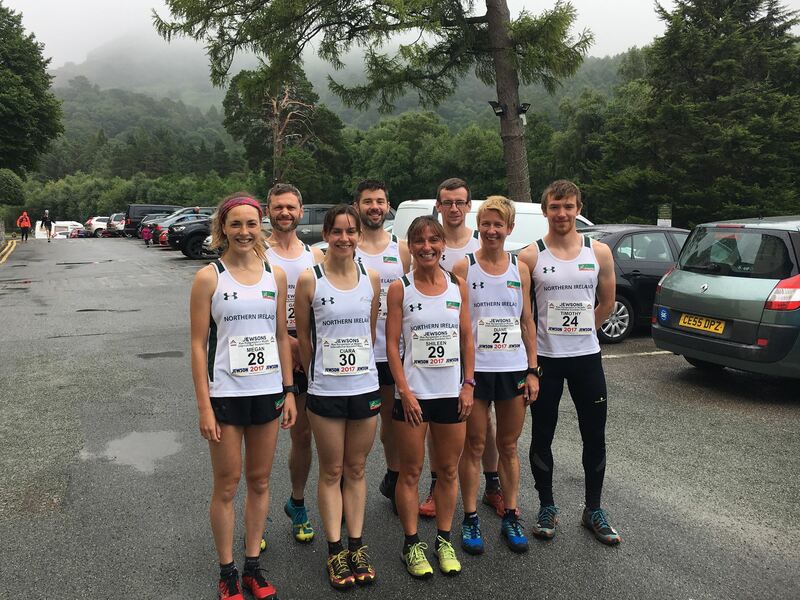 The NIMRA team for the event was David Hicks, Gavin Muholland, Tim Johnston, Connor Reid, Diane Wilson, Shileen O’Kane, Megan Wilson, and Ciara Largey. Scrubbing the pots out the back in the guise of team manager was some guy Richard Bell. 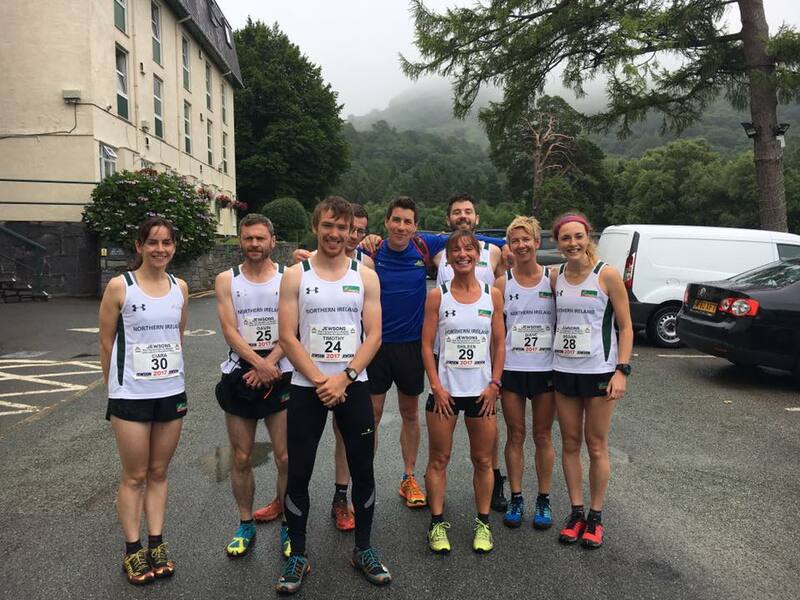 On the morning of the race the rain was lashing down and the mountains were shrouded in mist. By the time it rolled around to the race start the rain had stopped, it was mild but the mist was still thick. In the ladies race Megan led the charge for the NIMRA team. The pot scrubber caught her on the climb and thought he would never see her again. He was proved wrong. Megan made much better work of the long descent to leave him eating her dust and to take 10th place (1.27.30). Slightly further back (but not much), NI stalwarts, Diane and Shileen had quick descents to come in shortly afterwards in 13th (1.30.35) and 14th (1.30.59) respectively. Ciara finished the team placings off nicely in 20th (1.35.40). Gavin was the best placed NI man. After a seriously fast effort he was out sprinted for 10th place by Robbie Simpson on the line. He finished 11th (1.12.56). Meanwhile David and Tim battled the whole way through the race. They both reached the summit in a time of 51.25 but Tim had the better descent to shade it in 27th (1.17.07) with David 32nd (1.17.42). Despite not knowing that he was coming on the trip until Friday morning at 8.30am Connor ran well to finish in 85th with 1.26.07. In the international team managers race (I am sure that is a real category and I await my prize) I finished first and I survived. This was my first time at this race and it definitely comes with a thumbs up. Great spot, good atmosphere and fabulous mountain for running although it would have been nice to get a sight of a view – next time maybe.